​The 1sts were back on home soil keen to make amends for the last week's poor showing at Capel. After winning the toss they elected to field confident in the knowledge that the Hill track would maintain its quality throughout the day. There was a time where that decision looked to have backfired as the visitors were comfortbaly 100/1 at the halfway stage of their innings. However, all of a sudden wickets began to fall with Richie Bowers (upper left, 4/20) and Dane Palmer (3/30) the executors-in-chief whilst being supported by a miserly spell from Clive Bulpitt (1/27). This saw South Nutfield collapse to 134 all out with 8 overs spare. ​The chase was initially interrupted by Marc Cobby's early dismissal but Mike Dawson (42) and Ben West (lower left, 51) took the flicker of hope away from them and although they were dismissed just short of the target, Dave Burke (30*) steered The Hill home with the help of Owen Bartlett and on to collect the full 30 points and apply pressure back on the leaders. 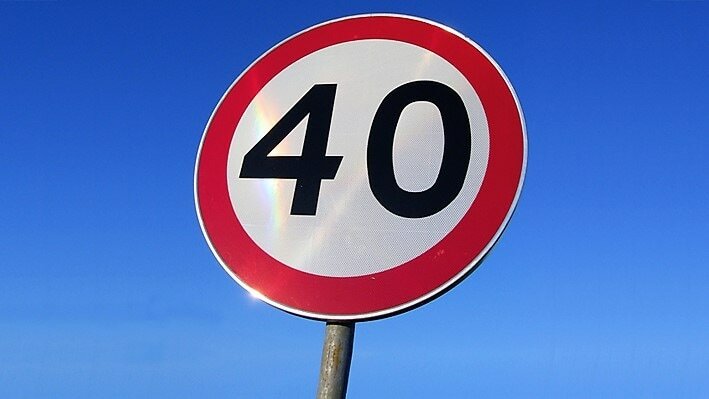 ​After a disappointing showing the week before the 2nds would have hoped for an easier fixture than travelling to leaders Old Suttonians who had only dropped 5 out of 150 points all season, but that didn't stop them providing a scare. ​The hosts batted first and runs were restricted early on with customarily tight and swift bowling from Chris and Simon Ely (upper left) and although wickets weren't falling they were never really able to cut loose and managed to just secure full batting points posting 208/4 from their 40 overs. ​After a couple of early wickets fell in the reply Simon and Graeme Kitchen settled things down with a 3rd wicket partnership that provided hope of an upset. However, once both fell and both Ricky Newman and Russell Ely fell relatively cheaply only Graham Jackson (lower left, 32) provided substantial resistance and once he was dismissed the rest followed in a 45 run defeat. The 2nds did climb a place to 4th though! ​After an impressive win over East Horsely the previous week, the 1sts travelled to nearby Capel hopeful of putting some pressure on the leaders. After electing to bat they soon realised that wasn't going to be an easy task. ​The hosts maintained an impressive line and length throughout the innings and as such picked up wickets with unnerving regularity with very few Hill batsman making an impression. Mick Dawson stoically repelled the attack from the top of the order with a patient 48, but aside from Garry Bartlett (16) and Dane Palmer (left above, 19) he received little support and they were bowled out for 126 with 3 overs to spare. ​The reply began positively when Palmer struck in his third over, but there were no breakthroughs after that until Matt Camp (left below) struck late on. Capel duly completed a comfortable run chase with 11 overs to spare and The Hill dropped to 4th in the table but will look to rebuild when South Nutfield visit next week. ​The 2nds welcomed Woldingham Village to The Hill on Saturday and after a fairly dry week they elected to bat after winning the toss, but the display that followed belayed that decision. ​Wickets fell all too regularly with no significant partnership built aside from Tom Barker (20) and Dan Bishops (left above, 17) who put on 31 for the 7th wicket until both were dismissed in quick succession along with the tail and that left a paltry 94 to defend. ​As it happens they very nearly managed it. Jack Lintott (left below, 3/24) and Simon Ely (2/24) opened the bowling and quickly took 5 wickets between them, along with Bishop chipping in, but 'keeper Botejue and opening bowler Malinda stemmed the flow of wickets and broke the back of the challenge with a 36 run partnership, and although Ely removed Malinda Angelo Rodrigo came to the crease to steer the visitors home with 17 overs to spare, but not as comfortably as they might have imagined. The Hill drop to 5th as a result and travel to unbeaten leaders Old Suttonians next. ​The 1sts welcomed perennial title-contender East Horsley 1sts to The Hill and historically this hasn't been a fixture where they have prospered. ​After a bout of overnight rain The Hill elected field after winning the toss but the visitors began their innings well, repelling the initial pace of Mark Swallow (lower left) and Dane Palmer. However, skipper Richie Bowers (upper left) then came to the fore claiming 5/39 with 7 overs of off spin amd this was largely responsible for restricting East Horsley to 201/8. ​Although Marc Cobby fell first ball, Dave Harms, Ben West and Bowers himself all steadily went about their way to close in on the target. however, there was a late wobble that made the closing stages of the run-chase very nervy. 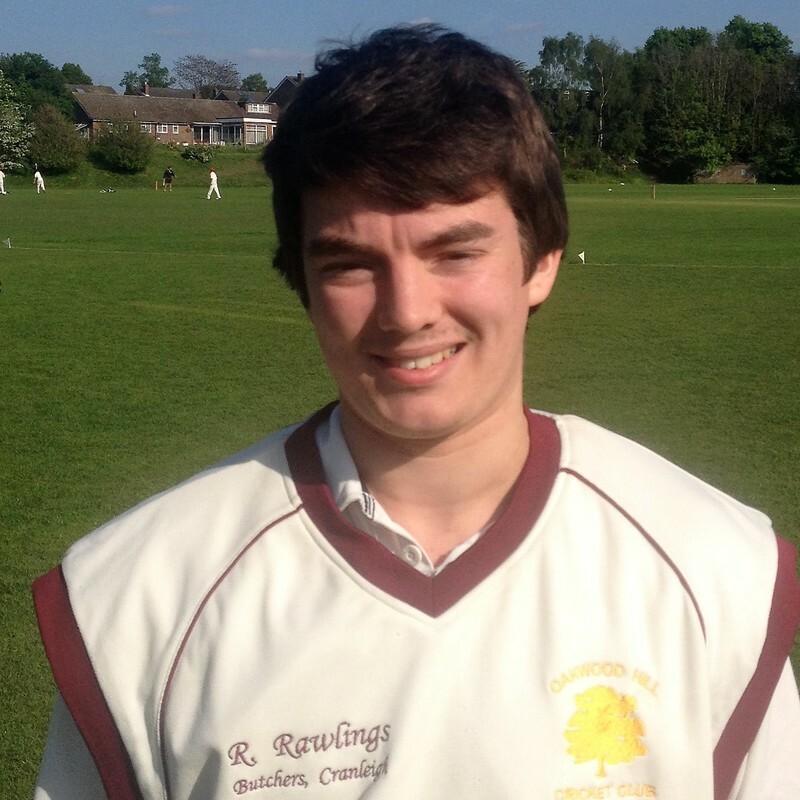 16 year old Owen Bartlett joined Bowers at the fall of the 8th wicket and together they calmly scored the 30 remaining runs to claim 29 points and seize third place in the table. ​The 2nd XI visited East Horsley conscious of the fact that this hadn't been the most prosperous ground for them in the past, but they emphatically put that right on this occasion. ​Having elected to bat The Hill slowly but surely set about ensuring that they utilised their full allocation of overs on a surface that was offering some assistance to the bowlers when the ball was put in the right areas. Mick Dawson underpinned that effort with 49 and was ably assisted by Jack Howick's (upper left) return to form with his 31 although the final total of 163/8 looked obtainable. ​Although home opener Ian Mair hit a threatening 36 at the top of the innings, he was deprived of any meaningful support due an exceptional bowling effort led by Daniel Bishop (lower left, 4/11) and supported by youngster Toby Dawson (2/20), Russell Ely (1/7 off 8 overs), Jonny Prior (1/29) and sharp fielding that contributed 2 run outs. As such they dismissed the hosts for a paltry 93 and with a sizeable victory they maintained third place in the table. ​The 1sts travelled to the home of the Champions looking to make amends for a number of below par performances on the ground in recent years. After being asked to bat on a damp surface, it looked like they would have their work cut out to disturb the pattern. As it was only the top three reached double figures and after openers Dave Harms and Marc Cobby fell in the teens, Ben West (upper left, 88) ploughed a loan furrow as his partners came and went and the visitors eventually stumbled to 154/9. ​With the pitch drying out, stunting the hosts' reply looked a tough ask, but two early strikes by Dane Palmer (lower left) and a brace from Owen Bartlett later on gave hope with the score at 60/4, however this brought the Longhurst brothers to the crease and their brand of hitting proved destructive. Despite a desperate rotating of the bowlers there was no stopping the onslaught and North Holmwood reached the target with more than 11 overs to spare and with it consign The Hill to their first defeat of the season. ​After a disappointing showing at Salfords the previous week, the 2nds were at home to a Wonersh side that had surprisingly lost their first two matches of the season. ​After being asked to bat, openers Mike Dawson (46) and Simon Ely (upper left, 92) set about a destructive job of getting The Hill's innings off to a flying start. Simon's brutal hitting brought seven 4s and eight 6s and saw the score at 129 when he was first to depart and it was 158 when Mike departed second down. Unfortunately there was little else to follow that and the innings closed at 211 all out with 13 balls spare. ​It mattered little as it proved as Simon then proceeded to cause further havoc with the ball, taking 4/16 from his 8 overs and removing the bulk of the batting threat. Dan Bishop (lower left, 3/21), Jack Lintott (2/14) and Chris Ely (1/30) did a clinical job of mopping up the rest of the visiting line-up and as such a comprehensive 128 run victory was sealed with nearly 13 overs to spare. The win sees the 2nds back up to 3rd in the table. ​The 1sts welcomed Salfords to The Hill with both sides having claimed impressive wins in the first round of matches. After a bit of overnight rain the visitors were asked to bat and despite some early bludgeoning from the openers, Dane Palmer (3/28, upper left) and Mark Swallow (2/49) kept their cool pegged them back from 42/0 to 52/4. Owen Bartlett (2/19) and Clive Bulpitt (1/27) kept the pressure on and reduced them to 93/7 but then the tail wagged before Matt Camp (2/20) and Palmer returned to finish the innings at 184/10. 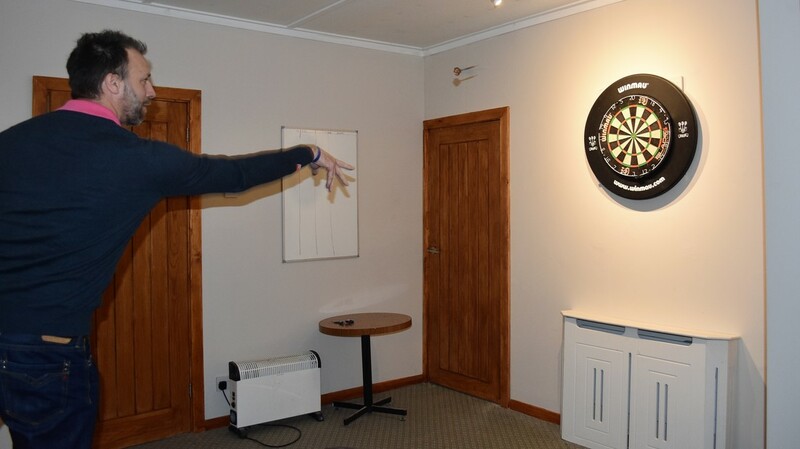 ​The target ended up being more competitive than hoped for at one point but the home openers Stu Martin (33) and particularly Dave Harms (112, lower left) wasted no time in making it look less so. Harms splayed 19 fours and 3 sixes in the first century of the season and his first ton since South Nutfield nearly 3 years ago and Martin ably played the supporting role. Both fell before the end but Mike Dawson and Richie Bowers secured the win with 35 balls to spare and 30 points taken. Special mention to Tom Barker who made his 1st team debut behind the stumps and put in an impressive display with two excellent catches to top it off. 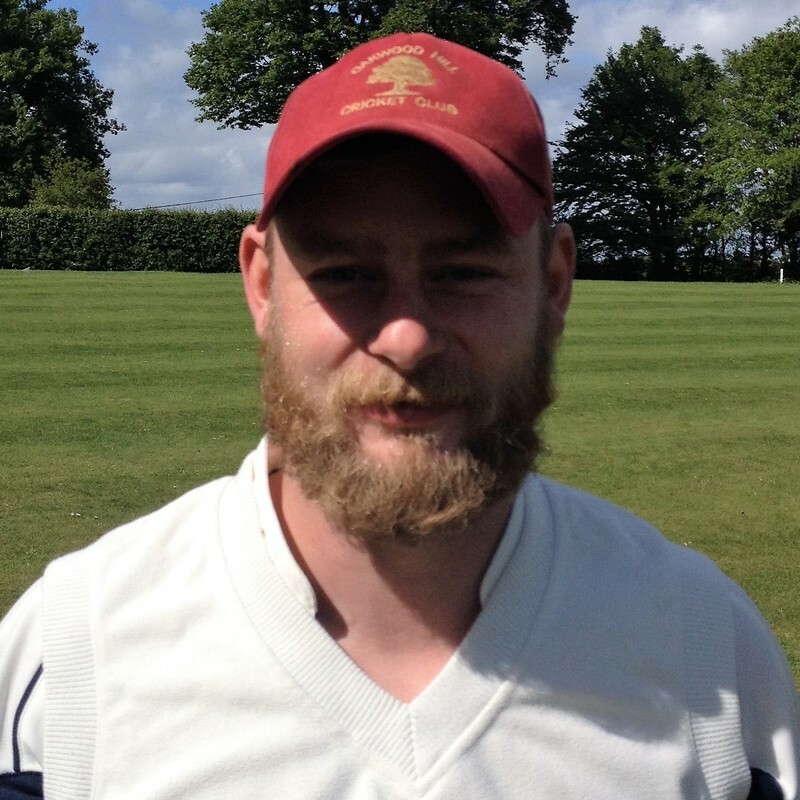 ​The 2nds were on the road for the first time this season at Salfords and due to a significant degree of absenteeism were unfortunately one man short. Nevertheless after being put into the field they battled away well with Dan Bishop (3/40) and Jonny Prior (4/24, upper left) being the primary wicket takers and ensuring that the hosts certainly weren't out of sight when they were bowled out for 222 in the final over. ​The reply got off to a poor start with Graham Jackson and Jack Howick dismissed early leaving The Hill on 14/2. However, SImon Ely (31) and Jack Lintott (41, lower left) began to rebuild in their usual style. However, these two proved to be the two top scorers and although Bishop and skipper Neil Overington also posted double figures, the lack of any other notable partnerships meant that the hosts were always on top during the second half of the game. As such, even though there were still 15 overs to go they were all out for 131. Despite the result, and although it is early days, they remain in the top half of the table with two games gone and move on to hosting Wonersh next week. ​The waiting came to an end on Saturday as the 1sts travelled to Nutfield in their first SDL match of the season and it proved to be a fruitful day. 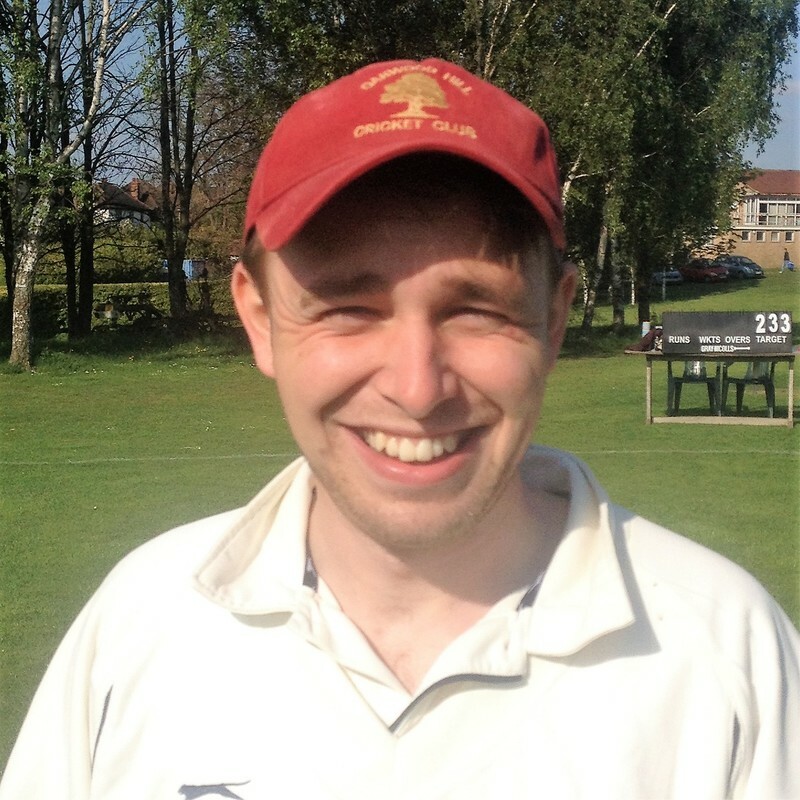 ​After electing to bat the 1sts were rarely troubled as they gradually accelerated through an innings that saw them post 234/5 off their 40 overs. Opener Marc Cobby (upper left) top scored with 74 but Luke Palmer (58) and Richie Bowers (40*) also provided valuable contributions. Mark Swallow (lower left) struck early in the hosts' reply but some dogged batting afterwards saw the target begin to be threatened until Dave Harms forced a moment of indecision with his off-spin and Bowers pounced to run out the obstinate opener who perhaps should have been given out when appearing to nick behind off Owen Bartlett some overs earlier. This breakthrough paved the way for Bowers, Matt Camp and Swallow to turn the screw and dry up the runs to the point where big risks had to be taken and with it came a flurry of wickets in the closing overs that ensured an eventually comfortable 28 run (29 points) win. ​The 2nds welcomed Ockham for the first league action at The Hill of the 2017 season and were asked to bat by the visitors. Graham Jackson (66, upper left) and Simon Ely got the hosts off to a positive start with a 50 opening partnership before Ely fell, but then Mike Dawson helped see them up to 131/1. What followed was a nearly fatal collapse that soon saw the score at 143/7 but captain Neil Overington (47*) and Chris Ely (15, below left) steadied the ship and ensured a competitive 225/8 was eventually posted. ​Chris Ely took a wicket in just the second over of the reply, but the visitors then progressed to 69/1 fairly untroubled and looked to threaten the target. However Chris and Russell Ely took 4 more wickets between them to reduce Ockham to 112/5 and although there was a spirited 50 from their captain The Hill, through Dan Bishop, Toby Dawson and Jonny Prior, kept them at arm's length in the latter stages and this resulted in the visitors ultimately coming up 15 runs short and with it ensured that the 2nds matched the 29 points secured by the 1sts and making for a very pleasing first week all-round. ​On the eve of the 2017 season, which commences with the visit of Team Mitcham on Saturday in a friendly match, The Club are delighted to confirm the work that has been undertaken to the pavilion over the winter. ​All toilet facilities have now been completely refurbished along with the access to both them and the changing rooms (below). 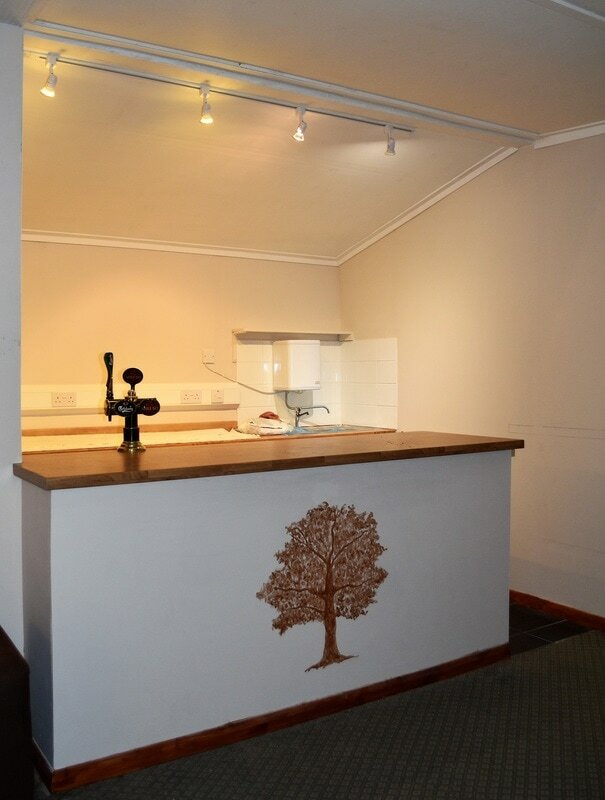 ​Also, the new bar, complete with custom artwork (left) has now been fitted and should be fully functional in the coming weeks along with new furniture throughout the main space. ​With the old bar soon to be taken out and construction of the new kitchen also to begin this year it truly is exciting times off the field at The Hill. Ahead of the initial draw for the Davidstow National Village Cup The Hill were hopeful that at the 4th time of asking they would finally get a home draw in the Surrey Group. ​Fortunately we have been granted that wish and we will host Rowledge from the second tier of the Southern Premier Cricket League on Sunday 14 May 2017. ​The match will start at 13:00 and will be 40/40 win/lose, which is now in line with the rest of our competitive weekend cricket. ​We look forward to welcoming our opponents from the other side of the county and hope for good weather on the day. At the Surrey Downs League AGM, it was narrowly passed that all matches in the three divisions would be contested on a win/lose basis with a maximum of 40 overs a side, a format that the 3rd Division employed in full last season. ​The decision means that there will be no win/lose/draw matches in 2017 and it was also passed that bowlers will now be limited to 8 overs each in a full innings. ​It is hoped that the move to this new full-season format will encourage younger players to remain in the game and also ensure a more palatable finish time to matches in comparison to the old 90 over day. 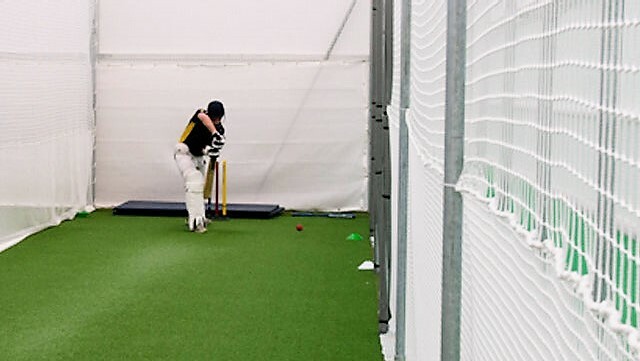 ​The Club are once again preparing for the forthcoming season with indoor nets sessions at Cranleigh School. ​Come down and get your eye in before the season starts with our first friendly matches on 8 and 9 April.